Wild Fangs © 2007 Atronic. Join the sly, prowling and howling creatures in the Harmony game Wild Fangs where top symbol, 'Wolf' substitutes for all symbols except scatters and awards the corresponding win according to a wild multiplier. The unique dual screen comes into play when three or more 'WolfMoon' scatter symbols trigger the free games. 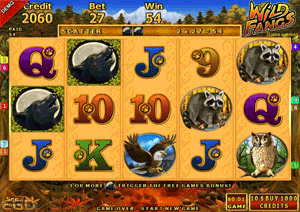 Additionally, the wild multiplier is awarded with any 'Wolf' substitute win within the free games. Win up to 300 free games. Available in English and Russian language (software & artwork). Additionally the game is available with Portuguese artwork.